For the Hip-Hop group, see World's Fair (group). A world's fair, world fair, world expo, universal exposition, or international exposition (sometimes expo or Expo for short) is a large international exhibition designed to showcase achievements of nations. These exhibitions vary in character and are held in different parts of the world. The most recent international exhibition, Expo 2017, was held in Astana, Kazakhstan. Dubai, United Arab Emirates has been selected to host WORLD EXPO 2020. Osaka, Japan has been selected to host World Expo 2025. Since the 1928 Convention Relating to International Exhibitions came into force, the Bureau International des Expositions (BIE; English: International Bureau of Exhibitions) has served as an international sanctioning body for world's fairs. Four types of international exhibition are organised under the auspices of the BIE: World Expos, Specialized Expos, Horticultural Expos (regulated by the International Association of Horticultural Producers) and the Triennale di Milano. Depending on their category, international exhibitions may last from three weeks to six months. The best-known 'first World Expo' was held in The Crystal Palace in Hyde Park, London, United Kingdom, in 1851, under the title "Great Exhibition of the Works of Industry of All Nations". The Great Exhibition, as it is often called, was an idea of Prince Albert, Queen Victoria's husband, and is usually considered to be the first international exhibition of manufactured products. It influenced the development of several aspects of society, including art-and-design education, international trade and relations, and tourism. This expo was the precedent for the many international exhibitions, later called world's fairs, that have continued to be held to the present time. The character of world fairs, or expositions, has evolved since the first one in 1851. Three eras can be distinguished: the era of industrialization, the era of cultural exchange, and the era of nation branding. The first era, the era of "industrialization", roughtly covered the years from 1800 to 1938. In these days, world expositions were largely focused on trade and displayed technological advances and inventions. World expositions were platforms for state-of-the-art science and technology from around the world. The world expositions of 1851 London, 1853 New York, 1862 London, 1876 Philadelphia, 1889 Paris, 1893 Chicago, 1897 Brussels, 1900 Paris, 1901 Buffalo, 1904 St. Louis, 1915 San Francisco, and 1933–34 Chicago were notable in this respect. Inventions such as the telephone were first presented during this era. This era set the basic character of the world fair. The 1939–40 New York World's Fair, and those that followed, took a different approach, one less focused on techology and aimed more at cultural themes and social progress. For instance, the theme of the 1939 fair was "Building the World of Tomorrow"; at the 1964–65 New York World's Fair, it was "Peace Through Understanding"; at the 1967 International and Universal Exposition in Montreal, it was "Man and His World". These fairs encouraged effective intercultural communication alongside with sharing of techological innovation. From World Expo 88 in Brisbane onwards, countries started to use expositions as a platform to improve their national image through their pavilions. Finland, Japan, Canada, France, and Spain are cases in point. A major study by Tjaco Walvis called "Expo 2000 Hanover in Numbers" showed that improving national image was the main goal for 73% of the countries participating in Expo 2000. Pavilions became a kind of advertising campaign, and the Expo served as a vehicle for "nation branding". According to branding expert Wally Olins, Spain used Expo '92 and the 1992 Summer Olympics in Barcelona in the same year to underscore its new position as a modern and democratic country and to show itself as a prominent member of the European Union and the global community. At Expo 2000 Hanover, countries created their own architectural pavilions, investing, on average, €12 million each. Given these costs, governments are sometimes hesitant to participate, because the ultimate benefits do not ultimately justify the costs. While the tangible effects are difficult to measure, an independent study for the Dutch pavilion at Expo 2000 estimated that the pavilion (which cost around €35 million) generated around €350 million of potential revenues for the Dutch economy. It also identified several key success factors for world-exposition pavilions in general. 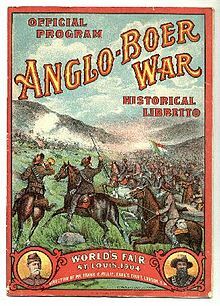 St. Louis 1904 World's Fair Boer War program. Battle recreations took 2–3 hours and included several Generals and 600 veteran soldiers from both sides of the war. At the conclusion of the show, the Boer General Christiaan de Wet would escape on horseback by leaping from a height of 35 feet (11 m) into a pool of water. Presently, there are two types of international exhibition: World Expos (formally known as International Registered Exhibitions) and Specialised Expos (formally known as International Recognised Exhibitions). World Expos, previously known as universal expositions, are the biggest category events. At World Expos, participants generally build their own pavilions. They are therefore the most extravagant and most expensive expos. Their duration may be between six weeks and six months. Since 1995, the interval between two World Expos has been at least five years. The latest World Expo Expo 2015 was held in Milan, Italy, from 1 May to 31 October 2015. Specialized Expos are smaller in scope and investments and generally shorter in duration; between three weeks and three months. Previously, these Expos were called Special Exhibitions or International Specialized Exhibitions but these terms are no longer used officially. Their total surface area must not exceed 25 ha and organizers must build pavilions for the participating states, free of rent, charges, taxes and expenses. The largest country pavilions may not exceed 1,000 m2. Only one Specialised Expo can be held between two World Expos. An additional two types of international exhibition may be recognized by the BIE: horticultural exhibitions, which are joint BIE and AIPH-sanctioned 'garden' fairs in which participants present gardens and garden pavilions; and the semi-regular Milan Triennial (not always held every third year) art and design exhibition, held in Milan, Italy, with the BIE granting official international exhibition status to 14 editions of the Triennale between 1996 and 2016. World Expos (formally known as International Registered Exhibitions) encompass universal themes that affect the full gamut of human experience, and international and corporate participants are required to adhere to the theme in their representations. Registered expositions are held every 5 years because they are more expensive as they require total design of pavilion buildings from the ground up. As a result, nations compete for the most outstanding or memorable structure—recent examples include Japan, France, Morocco, and Spain at Expo '92. Recent Registered Expositions include Brussels Expo '58, Montreal Expo 67, Vancouver Expo 86, Osaka Expo '70, and Seville Expo '92. Sometimes prefabricated structures are also used to minimize costs for developing countries or for countries from a geographical block to share space (i.e. Plaza of the Americas at Seville '92). The only Registered (Universal) exposition to be held without BIE approval was the 1964–1965 New York World's Fair. The sanctioning organization at Paris denied them "official" status because its president, Robert Moses, did not comply with BIE rules in place at the time, namely the one limiting the duration for universal expositions to six months only. The two World's Fairs in New York (1939–40 and 1964–65) and the Century of Progress in Chicago (1934-1935) have the distinction of being the only two-year world expositions in history. The Fair proceeded without BIE approval and turned to tourism and trade organizations to host national pavilions in lieu of official government sponsorship. However, a large number of countries did participate in the world's fair including several newly independent African and Asian states. Frederick Pittera, a producer of international fairs and exhibitions and author of the history of world's fairs in the Encyclopædia Britannica and Compton Encyclopedia, was commissioned by Mayor Robert F. Wagner Jr. of New York City in 1959 to prepare the first feasibility studies for the 1964 New York World's Fair. Pittera was joined in his study by Austrian architect Victor Gruen (Inventor of the 'Shopping Mall'). The Eisenhower Commission ultimately awarded the world's fair bid to New York City against several major U.S. cities. In the 21st century the BIE has moved to sanction expos only every five years; following the numerous expos of the 1980s and 1990s, some see this as a means to cut down potential expenditure by participating nations. The move was also seen by some as an attempt to avoid conflicting with the Summer Olympics. The rule may apply to all expos, or it may end up that universal expositions will be restricted to every five years or so, with international or specialized expositions in the in-between years for countries wishing to celebrate a special event. Specialized Expos (formally known as International Recognized Exhibitions) are usually united by a precise theme—such as 'Future Energy' (Expo 2017 Astana), 'The Living Ocean and Cost' (Expo 2012 Yeosu, or 'Leisure in the Age of Technology' (Brisbane, Expo '88). Such themes are more specific than the wider scope of world expositions. The Specialized Exposition, Tsukuba, Japan, popularly known as Expo '85 was held in the city of Tsukuba located near Tokyo. This Exposition is more formally known as "The International Science Technology Exposition". Specialized Expos are usually smaller in scale and cheaper to run for the host committee and participants because the architectural fees are lower and they only have to customize pavilion space provided free of charge from the Organiser, usually with the prefabricated structure already completed. Countries then have the option of 'adding' their own colours, design etc. to the outside of the prefabricated structure and filling in the inside with their own content. List of official world expositions (Universal and International/Specialised) according to the Bureau International des Expositions. ASIMO at Expo 2005 in Japan. The majority of the structures are temporary and are dismantled after the fair closes. Landmark towers from several fairs are notable exceptions. By far the most famous of these is the Eiffel Tower, built for the Exposition Universelle (1889). Although it is now the most recognized symbol of its host city Paris, a number of influential contemporary critics opposed its construction, and there were demands for it to be dismantled after the fair's conclusion. 1851 – London: The Crystal Palace, from the first World's Fair in London, designed so that it could be recycled to recoup losses, was such a success that it was moved and intended to be permanent, only to be destroyed by a fire in 1936. 1876 – Philadelphia: The Centennial Exposition's main building, Memorial Hall, is still in Fairmount Park, Philadelphia, and serving as the new home for the Please Touch Museum. The space under the entrance to Memorial Hall houses a scale model of the entire Exposition. 1880 – Melbourne: The World Heritage-listed Royal Exhibition Building in Melbourne, constructed for the Melbourne International Exhibition. 1893 – Chicago: The Museum of Science and Industry in Chicago is housed in the former Palace of Fine Arts, one of the last remaining buildings of the World's Columbian Exposition. In conjunction with the fair, the Art Institute of Chicago building was built to house conferences, as the World's Congress Auxiliary Building. The intent or hope was to make all Columbian structures permanent, but most of the structures burned, possibly the result of arson during the Pullman Strike. The foundation of the world's first Ferris wheel, which operated at the Exposition, was unearthed on the Chicago Midway during a construction project by the University of Chicago, whose campus now surrounds the Midway. Relocated survivors include the Norway pavilion, a small house now at a museum in Wisconsin, and the Maine State Building, now at the Poland Springs Resort in Maine. 1894 – San Francisco: The Japanese Tea Garden in San Francisco's Golden Gate Park is the last major remnant of the California Midwinter International Exposition. Large ornamental wooden gates and a pagoda from the 1915 Panama-Pacific International Exposition were brought in after the latter fair closed, making the Tea Garden a rare if not unique instance of a survivor that incorporates architectural features from two completely separate fairs. 1897 – Nashville: A full-scale replica of the Parthenon was built for the Tennessee Centennial and International Exposition where it stands today in Nashville's Centennial Park. It features plaster reproductions of the Elgin Marbles and, in 1990, a re-creation of the original Athena Parthenos statue was installed inside just as it was in the original Parthenon in ancient Greece. 1900 – Paris: the Grand Palais and Petit Palais. 1901 – Buffalo: The New York State pavilion at the Pan-American Exposition remains today as the home of the Buffalo History Museum, and is set on grounds originally laid out by Frederick Law Olmsted. Across the man-made lake on the Scajaquada Creek is the Albright–Knox Art Gallery, originally intended as the Beaux Arts Exhibition Hall, but not completed in time for the exhibition. 1904 – St. Louis: The St. Louis Art Museum in Forest Park, originally the Palace of the Fine Arts, and Brookings Hall at Washington University in St. Louis, are remnants of the Louisiana Purchase Exposition (held a year late, as it was originally intended to be the centennial of the Louisiana Purchase. But organizers, and President Theodore Roosevelt, wanted the fair to be held during the Olympics which were moved from Chicago. ), better known as the St. Louis World's Fair. The aviary in Forest Park gave root to the St. Louis Zoo. 1906 – Milan: The Civic Aquarium of Milan built for the Milan Exposition is still open after 100 years and was recently renovated. The International Commission on Occupational Health (ICOH) was settled in Milan during the fair and had its first congress in the Expo pavilions. 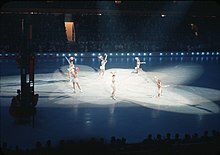 In June 2006 the ICOH celebrated the first century of its life in Milan. An elevated railway with trains running at short intervals linked the fair to the city center. It was dismantled in the 1920s. 1909 – Seattle: The landscaping (by the Olmsted brothers) from the Alaska–Yukon–Pacific Exposition (AYPE) in Seattle still forms much of the University of Washington campus. The only major building left from the AYPE, Architecture Hall, is used by the university's architecture school. 1915 – San Francisco: The Palace of Fine Arts in San Francisco and its adjacent artificial lagoon are the only major remnants of the Panama-Pacific International Exposition still in their original locations on the former fairgrounds (now the city's Marina District neighborhood), but the building is almost entirely a reconstruction. The plaster-surfaced original, not intended to survive after the fair, was a crumbling ruin in 1964 when all but the steel framework was demolished so that it could be reproduced in concrete. The San Francisco Civic Auditorium, now the Bill Graham Civic Auditorium, is another major legacy of the fair but was built off-site in the city's Civic Center. The independent Panama-California Exposition in San Diego left a substantial legacy of permanent buildings and other structures which today define its site, San Diego's central Balboa Park, including the Prado walkway, the California Tower and Dome (now home to the Museum of Man), the 1,500-foot Cabrillo Bridge, the lily pond and botanical gardens, and the Spreckels Organ Pavilion. 1929 – Seville & Barcelona: Much survives from the two simultaneous fairs Spain hosted in that year. Most famous are the remnants of the Ibero-American Exposition in Seville, in which the Spanish Pavilion's Plaza de España forms part of a large park and forecourt. Most of that fair's pavilions have survived and been adapted for other uses, with many of them becoming consulates-general for the countries that built them. The Barcelona International Exposition featured the famous German pavilion designed by Mies van der Rohe, which was demolished but later recreated on the original site. 1936 – Johannesburg: The Empire Exhibition, South Africa was built close to the University of the Witwatersrand, and by the late 1970s the growth of the university was large enough to incorporate the permanent buildings from the exhibition. In 1985, the university purchased the South African Government Building; the two Heavy Machinery Halls, now called Empire Hall and the Dining Hall; the Hall of Transport; the Tower of Light; the Cape Dutch complex; and the Bien Donne Restaurant. 1942 – Rome: A special case is the EUR quarter in Rome, built for a World's Fair planned for 1942 but cancelled because of World War II. Today it hosts various offices, both governmental and private, and several museums. 1958 – Brussels: In Brussels, the Atomium still stands at the exposition site. It is a 165-billion-times-enlarged iron-crystal-shaped building. Until June 2012, the "American Theatre" on the Expo grounds was frequently used as a television studio by the VRT. 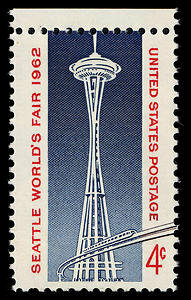 1962 – Seattle: The Space Needle, theme building of the Century 21 Exposition commonly known as the Seattle World's Fair, still stands as Seattle's iconic landmark. The Seattle Center Monorail, the other widely known "futuristic" feature of the fair, still operates daily. The US pavilion became the Pacific Science Center. 1964 – New York City: The Unisphere, built for the second New York World's Fair, still stands on its original site in Flushing Meadows, Queens, New York City. Also surviving are the building housing the New York State Museum, and the former Singer Bowl, since converted into Louis Armstrong Stadium, part of the Billie Jean King National Tennis Center, site of the US Open. 1967 – Montreal: Among the structures still standing from Expo 67 in Montreal are Moshe Safdie's Habitat 67, Buckminster Fuller's American pavilion the "Montreal Biosphere," the Jamaica Pavilion, the Tunisia Pavilion, and the French pavilion (now the Montreal Casino). 1968 – San Antonio: San Antonio kept the Tower of the Americas, the Institute of Texan Cultures and the Convention Center from HemisFair '68. 1974 – Spokane: Spokane still has its Riverfront Park that was created for Expo '74—the park remains a popular and iconic part of Spokane's downtown. 1982 – Knoxville: The Sunsphere from the Knoxville World's Fair remains as a feature of Knoxville's skyline. 1984 – New Orleans: The main pavilions of the 1984 New Orleans World's Fair became the Ernest N. Morial Convention Center, which is also known for its use as a shelter of last resort during Hurricane Katrina. 1986 – Vancouver: In Vancouver, many Expo 86 projects were designed as legacy projects. Of note are the Skytrain, Science World and Canada Place. 1988 – Brisbane: The Skyneedle, the symbol tower of Expo '88 in Brisbane, Queensland, Australia, still stands. Other survivors are the Nepal Peace Pagoda of the Nepalese representation, now at the transformed World Expo '88 site South Bank Parklands, and the Japan Pond and Garden from the Japanese representation, now at the Brisbane Mount Cooth-tha Botanic Gardens. In 2018 the World Expo 88 Art Trail was re-birthed and dramatically expanded as part of the 30th Anniversary of World expo 88, now forming a Major tourist attraction in its own right. 1992 – Seville: The pavilions of Expo '92 in Seville had been converted into a technological square and a theme park. 1998 – Lisbon: The main buildings of Expo '98 in Lisbon were completely integrated into the city itself and many of the art exhibition pieces still remain. 2005 – Nagoya: The home of Satsuki & Mei Kusakabe, built for the 2005 Expo in Aichi, remains operating at its original site in Morikoro Park and is a popular tourist attraction. 2010 – Shanghai: The China pavilion from Expo 2010 in Shanghai, the largest display in the history of the World Expo, is now the China Art Museum, the largest art museum in Asia. 2015 – Milan: The Italian Pavilion of Expo 2015 remains on the original site. Lisbon: Expo '98 which was divided in several structures, namely Pavilhão Atlântico, Casino Lisboa, Oceanário and Pavilhão do Conhecimento [pt]. The Argentine Pavilion from the 1889 Paris was relocated to Buenos Aires, Argentina until its demolition in 1932. The Peruvian Pavilion from 1900 Paris is now in Lima, as home to the Military Academy of History. The Japanese Tower of the 1900 World's Fair in Paris was relocated to Laken (Brussels) on request of King Leopold II of Belgium. The Belgium Pavilion from the 1939 New York World's Fair was relocated to Virginia Union University in Richmond, Virginia. The USSR Pavilion from Expo 67 is now in Moscow. The Sanyo Pavilion from Expo '70 is the Asian Centre at the University of British Columbia in Vancouver. The Portugal Pavilion from Expo 2000 is now in Coimbra, Portugal. The Bahrain Pavilion from Expo 2015 is relocated to Bahrain.The Azerbaijan Pavilion is in the country's capital Baku.The Chinese Pavilion was brought back to Qingdao and is on the site of the 2014 horticultural exhibition. The Save the Children Italy pavilion from Expo 2015 was dismantled and re-built as school for Syrian refugee children in Lebanon. The Brussels Expo '58 relocated many pavilions within Belgium: the pavilion of Jacques Chocolats moved to the town of Diest to house the new town swimming pool. Another pavilion was relocated to Willebroek and has been used as dance hall Carré ever since. One smaller pavilion still stands on the boulevard towards the Atomium: the restaurant "Salon 58" in the pavilion of Comptoir Tuilier. Many exhibitions and rides created by Walt Disney and his WED Enterprises company for the 1964 New York World's Fair (which was held over into 1965) were moved to Disneyland after the closing of the Fair. Many of the rides, including "it's a small world", and "Great Moments with Mr. Lincoln", as well as the building that housed the Carousel of Progress are still in operation. Disney had contributed so many exhibits to the New York fair in part because the corporation had originally envisioned a "permanent World's Fair" at the Flushing site. That concept instead came to fruition with the Disney theme park Epcot, an extension of the Walt Disney World Resort, near Orlando, Florida. Epcot has many of the characteristics of a typical universal exposition: national pavilions, as well as exhibits concerning technology and/or the future, along with more typical amusement park rides. Meanwhile, several of the 1964 attractions, relocated to Disneyland, have been duplicated at the Walt Disney World Resort. Occasionally other bits and pieces of the fairs remain. In the New York City subway system, signs directing people to Flushing Meadows, Queens remain from the 1964–65 event. In the Montreal subway at least one tile artwork of its theme, "Man and His World", remains. Also, a seemingly endless supply of souvenir items from fair visits can be found, and in the United States, at least, can often be bought at garage or estate sales. Many of these events also produced postage stamps and commemorative coins. The 1904 Olympic Games, officially known as the Games of the III Olympiad, were held in conjunction with the 1904 St. Louis fair, although no particular tie-in seems to have been made. The Exposition Universelle (1900) Paris was also loosely tied to the Olympic Games. Expo 2020 will be held in Dubai, United Arab Emirates, as a Registered Exposition. Dubai, United Arab Emirates has placed a bid themed "Connecting Minds, Creating the Future". Ayutthaya was Thailand's official nomination to host World Expo 2020. The province was chosen and approved as Thailand's bid city to host World Expo 2020 by the Thai cabinet as the Prime Minister, Abhisit Vejjajiva, announced during the Shanghai World Expo 2010. Ayutthaya brought a bid under the theme "Redefine Globalisation – Balanced Life, Sustainable Living" concept when bidding on behalf of Thailand to be the host country. However, Thailand's bid was disqualified by the Bureau of International Expositions due to concerns that the bid did not have sufficient government support. New York City – "Showcasing the World"
San Francisco – "Interculture: Celebrating the World's Cultures while Creating New Ones through Interaction and Exchange." Philippines did not bid for the Expo 2020 although Manila had been considered a possible contender under the theme "Manila, Celebrating Light and Life"
Brisbane, Queensland, Australia also considered putting an official bid to host Expo 2020 but did not bid. Sydney, New South Wales, Australia has been quoted by media reports as another potential candidate for the Australian 2020 bid. Expo 2023 will be held at the Argentine capital and will have a theme of “Science, Innovation, Art and Creativity for Human Development. Creative Industries in Digital Convergence”. The central Polish city of Łódź announced its candidacy to host EXPO 2022. It was promoted in the Polish Pavilion at the EXPO 2015 in Milan. Consequently, the Polish government officially submitted Łódź's candidacy to the International Bureau of Expositions on 15 June 2016. Minneapolis-Saint Paul made joint bids. At the end of the project examination phase, BIE Member States voted for Buenos Aires as the host city of Expo 2022/23 via a secret ballot at the BIE General Assembly, held in November 2017. Expo 2025 will be held at the Japanese city of Osaka and will have a theme of “Designing Future Society for Our Lives!”. Osaka made its official bid for the Expo on 24 April 2017 with the theme “Designing Future Society for Our Lives”. The Azerbaijani capital entered its candidacy before the deadline under the theme "Human Capital". The French capital was the first to declare its candidacy, under the theme "Sharing our Knowledge, Caring for our Planet". The candidacy was withdrawn in January 2018 due to budget constraints. The Russian city entered its candidacy on 22 May 2017 under the theme "Changing world: inclusive innovation is for our children and future generations". At the end of the project examination phase, BIE Member States voted for Osaka as the host city of Expo 2025 via a secret ballot at the BIE General Assembly, held in November 2018. The Los Angeles World's Fair is another non-BIE effort. The BIE, since 1959  grants recognition to the International Horticultural Exhibitions (Category A1) approved by the International Association of Horticultural Producers (AIPH) subject to it meeting certain criteria including being approved by the BIE general assembly. ^ Walvis, Tjaco, ed. (April 2004). "Three eras of World Expositions: 1851–present". Cosmopolite: Stardust World Expo & National Branding Newsletter. Amsterdam: Stardust New Ventures (5): 1. ^ Abbattista, Guido; Iannuzzi, Giulia (2016). "World Expositions as Time Machines: Two Views of the Visual Construction of Time between Anthropology and Futurama". World History Connected. 13 (3). ^ Ted Dykstra (Director) (2004). Expo'67: Back to the future (DVD). Canada: CBC Home Video. ^ Harrison Jacobs (22 April 2014). "15 Gorgeous Retro-Future Photos From The 1964 World's Fair". Business Insider. Retrieved 1 August 2014. ^ "Building the Fair – Five Men". nywf64.com. Retrieved 1 August 2014. ^ "Official Site of the Bureau International des Expositions". Bie-paris.org. 27 June 2013. Retrieved 25 September 2013. ^ a b "List of International Exhibitions". Retrieved 14 July 2006. ^ "The Controversy about the Eiffel Tower". Paris Eiffel Tower News. Archived from the original on 5 March 2016. Retrieved 3 February 2016. ^ "Crystal Palace: Joseph Paxton – Transported by moving company". Retrieved 19 June 2014. ^ PPIE Found Remnants: Architecture: Japanese Gates and Pagoda. Retrieved 10 January 2013. ^ "Balboa Park History". Archived from the original on 19 July 2011. Retrieved 16 May 2013. ^ "Home – South Bank – Visitor Info – What's On – Shopping – Dining – Attractions and more". Visit South Bank. 4 June 2009. Retrieved 1 May 2011. ^ "Artequin". Artequin.cl. Retrieved 1 May 2011. ^ "The UAE in World Expos | World Expos | Expo 2020, Dubai, UAE". Retrieved 5 December 2013. ^ "Jarahieh School for Syrian refugee children in Lebanon". Retrieved 27 January 2017. ^ "La nuova vita del villaggio Expo: una scuola in Libano". Retrieved 27 January 2017. ^ "Home – Carré". Carre.be. Retrieved 1 May 2011. ^ Oliveira, Elida (1 January 2010). "Deu na Imprensa—Disputa acirrada" (in Portuguese). Portal da Prefeitura da Cidade de São Paulo. ^ Hamilton, Louis (18 June 2013). "Yekaterinburg presents city's bid for 2020 World Expo". Yekaterinburg News. Archived from the original on 27 November 2013. Retrieved 20 June 2013. ^ "Overview | Expo 2020 Dubai, UAE". Expo2020dubai.ae. Retrieved 25 September 2013. ^ "EXPO 2020 için büyük yarış – Yeni Asır". Yeniasir.com.tr. Retrieved 1 May 2011. ^ "Thailand wants to host World Expo 2020". Channelnewsasia.com. 19 June 2010. Retrieved 1 May 2011. ^ "Thailand, World Expo 2020: Ayutthaya to be nominated as World Expo site". Bangkokpost.com. 5 April 2011. Retrieved 1 May 2011. ^ "Thailand 2020 World Expo : Three candidates". Bangkokpost.com. 5 September 2010. Retrieved 1 May 2011. ^ "Thailand World expo 2020 Ayutthaya via YOUTUBE". Youtube.com. 13 April 2011. Retrieved 1 May 2011. ^ Sritama, Suchat (5 April 2011). "Thailand, World Expo 2020 : Ayutthaya chosen as Thailand's bid city". My.news.yahoo.com. Archived from the original on 9 August 2011. Retrieved 1 May 2011. ^ "Ayutthaya disqualified for World Expo 2020". 12 June 2013. ^ "World's Fair EXPO 2020". Expo2020.us. Retrieved 1 May 2011. ^ "New York City 2020 | "Showcasing The World"". Freewebs.com. Retrieved 1 May 2011. ^ "Expo 2020 Silicon Valley". 2020worldsfair.com. Retrieved 1 May 2011. ^ Michaels, Daniel (19 February 2009). "The U.S. Can't Host a World Expo, and Fans Say That's No Fair". The Wall Street Journal. ^ "ExpoMuseum / potential bids for 2020". Expomuseum.com. Retrieved 1 May 2011. ^ "Captain Cook 250th Anniversary Celebration Citizens' Committee". Foundationexpo88.org. Retrieved 1 May 2011. ^ "Who stole our mojo? asks Sydney". The Age. 1 July 2007. Retrieved 15 September 2010. ^ "EXPO for Łódź. 60,000 visitors every day". Gazeta Wyborcza (in Polish). Retrieved 18 September 2015. ^ "Official Site of the Bureau International des Expositions". Retrieved 25 July 2016. ^ "Specialised Expo 2022/23". BIE Paris. Retrieved 17 December 2016. ^ "Los Angeles World's Fair". ^ "Election". BIE Paris. Retrieved 11 December 2016. ^ "Osaka launches formal bid to host 2025 World Expo". www.mainichi.jp/english/. Archived from the original on 28 April 2017. Retrieved 27 April 2017. ^ "Japan submits bid for World Expo 2025". www.bie-paris.org. Retrieved 27 April 2017. ^ "Baku bids for World Expo 2025". azernews.az. Retrieved 23 May 2017. ^ a b "World Expo 2025". www.bie-paris.org. Retrieved 18 March 2017. ^ "Application idea". www.expofrance2025.com. Retrieved 18 March 2017. ^ "France drops bid to host 2025 World Expo". reuters.com. Retrieved 22 January 2018. ^ "The United States becomes the 170th Member State of the BIE". 26 May 2017. ^ "Bringing the World's Fair Back to the U.S." 17 December 2015. Retrieved 20 July 2017 – via www.bloomberg.com. ^ Stone, Zara. "Inside San Francisco's 21st Century World's Fair". Retrieved 20 July 2017. ^ "Virtual reality features heavily at upcoming Worlds Fair Nano in Brooklyn". Full Dive Gamer. 27 August 2017. Retrieved 15 September 2017. ^ "Los Angeles Wants a Transit-Themed World's Fair, and It Might Actually Be a Great Idea". Retrieved 20 July 2017. ^ "International Horticultural Exhibition". Bie-paris.org. 18 April 2011. Retrieved 25 September 2013. ^ "Exhibitions, actual programme". AIPH. 11 January 2011. Archived from the original on 15 July 2014. Retrieved 1 May 2011. ^ "Floriade Amsterdam Almere 2022 (A1) – International Association of Horticultural Producers". aiph.org. Retrieved 20 July 2017. Geppert, Alexander C. T. (2010). Fleeting Cities. Imperial Expositions in Fin-de-Siècle Europe. Basingstoke/New York: Palgrave Macmillan. Findling, John E.; Pelle, Kimberly D., eds. (2008). Encyclopedia of World's Fairs and Expositions. Jefferson, NC and London: McFarland. López César, Isaac; Estévez‐Cimadevila, Javier (2018). "World Expos. Five structural approaches". Estoa. 7 (13): 7–22. doi:10.18537/est.v007.n013.a1. Look up Expo in Wiktionary, the free dictionary. Wikimedia Commons has media related to World's Fairs. Wikivoyage has a travel guide for World's Fair. Bureau International des Expositions Official website. Retrieved 10 January 2019. Expo Bids: The World's Fair Bid Tracker Information about bids for future world's fairs. Retrieved 10 January 2019. Expo FAQs General World's Fair questions answered at Celebrate 88. Retrieved 10 January 2019. Exposition Medals Award medals of American World's Fairs and Expos. Retrieved 10 January 2019. "Exposition Posters". Paintings and Drawings. Victoria and Albert Museum. Archived from the original on 27 October 2007. Retrieved 10 January 2019. Jon Paul Sank's World's Fairs Page Several thousand links to World's Fair websites, documentaries, home movies, audio, lectures, podcasts, music, pictures, view books, guide books, catalogues, other books, articles, blogs, digital collections. Includes all fairs in the BIE World Expo class and a selection of others. Minimalist format. Retrieved 17 April 2019. "A Treasury of World's Fair Art and Architecture: A Digital Archive, 1851–1986". Essays, images, virtual exhibits, postcards and ephemera. University of Maryland Libraries, Digital Collections. Retrieved 10 January 2019. Weltaustellung.net Photographs from thirteen fairs. Includes stereograms. Retrieved 10 January 2019. World Expos. A history of structures. Preview of sample pages of book by Isaac López Cesar about the structures of the buildings built for World Expos. Supported by the BIE. Retrieved 10 January 2019. World's Fairs and the Landscapes of the Modern Metropolis Posters, photographs, pamphlets, commemorative books, maps, government reports, and ephemera from the collection of the Beinecke Rare Book and Manuscript Library at Yale University. Retrieved 10 January 2019. "World's Fairs. Structure laboratory: the contribution of the buildings built for the World's Fairs to the history of architecture structural typologies". PhD thesis by Isaac López César. Retrieved 10 January 2019.